This seems to be the month for trendy dieting. Everyday I try to go gluten free, and everyday I fail. It’s not the end of the world! If I have to fail at something, I’m glad it’s that. There’s always tomorrow! Speaking of tomorrow (Sunday 3/23), La Dee Da is playing at Bissap Baobob in the Mission district of SF at 7pm. It’s a free show! Rumor has it Bogart the First will make an appearance. Omg! 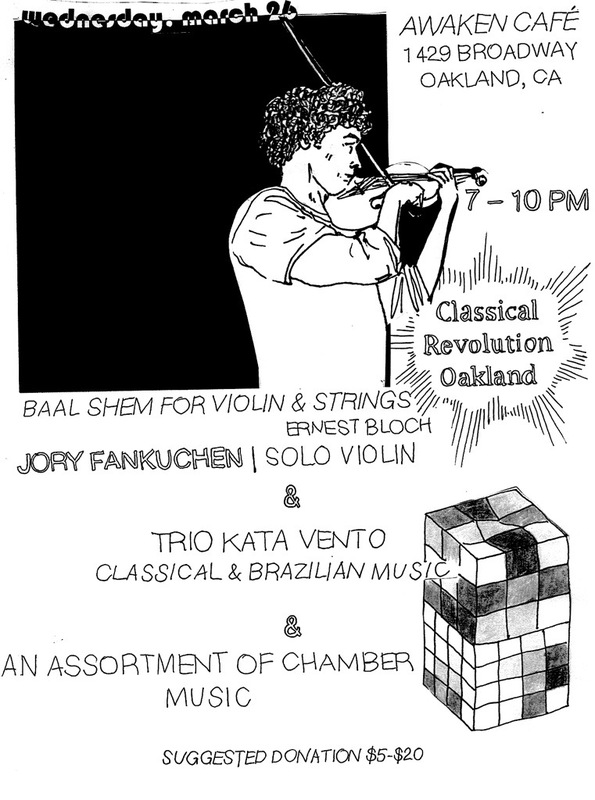 The next Classical Revolution Oakland show at Awaken Cafe is Wednesday, 3/26 from 7-10pm. This month will be badass! Jory Fankuchen is playing the solo violin part for Baal Shem by Ernest Bloch, and he is sounding great. The music is like Debussy goes to Temple. Trio Kata-Vento will also play some Latin-ified Stravinsky, among other flutey things, and the Town Quartet will play Ginastera’s first string quartet. Also, birds are chirping about a Mozart organ fantasy arrangement by Moses Lei. Obscure, but cool! Sunday 3/23 La Dee Da at Bissap Baobob. 2319 Mission St, San Francisco, CA 94110. 7pm, free! Wednesday 3/26 Classical Revolution Oakland at Awaken Cafe. 1429 Broadway, Oakland, CA 94612. 7-10pm, $5-$20 donation.